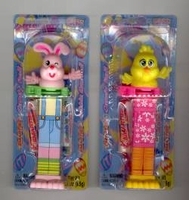 These Easter Candy Dispensers are similar to the pez dispensers, but these are for smarties instead. Smarties Easter klik dispensers make a great Easter basket filler or great to hand out as a party favor. You get a roll of smarties candy and a roll of smarties bubble gum. You'll have double the fun. Due to product availability we will select which candy dispenser to send, sorry.